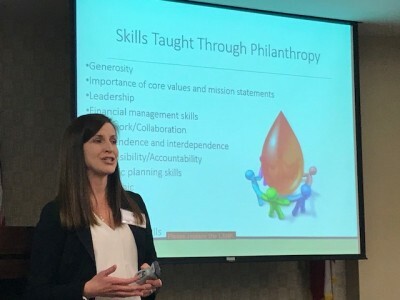 Huntsville, AL - On March 8, 2018, Jessica Hovis Smith, Vice President and Director of Financial Planning at Longview Financial Advisors, Inc., presented “Bridging the Generation Gap: Using Philanthropy to Create Successful Families.” This event was sponsored by the Community Foundation of Greater Huntsville to provide our donors with the resources they need to help make our great community even better through philanthropy. What is the generation gap in relation to wealth? Immigrants to Wealth, those who have either earned their wealth or acquired it through a windfall event, often display a high level of autonomy, self-sufficiency, perseverance, strong work ethic, and the ability to manage their own assets. The next generation, the Natives to Wealth, can lack an understanding of what created the wealth and the skills and education to continue growing the wealth. This generation needs to develop the skills of the previous generation as well as relying on the support of advisors to continue to grow the wealth. Their offspring must continue this process while also developing a process of governance to ensure its continuity. Jessica cited the adage “shirtsleeves to shirtsleeves in three generations” to highlight the skills needed in each generation when acquiring and then retaining the family’s wealth. Is financial capital the only factor a family needs to consider when looking at wealth transfer? Family capital is broader that just money. It also includes human, intellectual, social, and financial capital. What role do each of these play in creating successful families? • Human capital - What are the individual attributes of each family member and how does the family use and share the skills of individuals within the family? How can the family enhance members’ skills? • Intellectual capital - What are the family’s core values and mission? How is the family using each member’s education and skills? • Social capital – What/who are the family’s connections? What are the family’s philanthropic goals and how can each individual contribute to the goals? • Financial capital – How can the financial capital be used to address the human, intellectual, and social capital? How will stewardship be addressed? What are some specific ways I can include my children in our philanthropic goals? The key is to find age-appropriate ways to engage your children or grandchildren in philanthropy. If you are interested in learning more the Community Foundation and the work we do to support families’ philanthropic goals, please contact Stuart Obermann at stuart@communityfoundationhsv.org or 256.535.2066.
on Friday, 09 March 2018.